TOKYO-Mitsui O.S.K. Lines, Ltd. (MOL; President: Koichi Muto) today announced the completion of the hybrid car carrier Emerald Ace, designed to generate zero emissions while berthed, at the Mitsubishi Heavy Industries, Ltd. (MHI; President: Hideaki Omiya), Kobe shipyard. 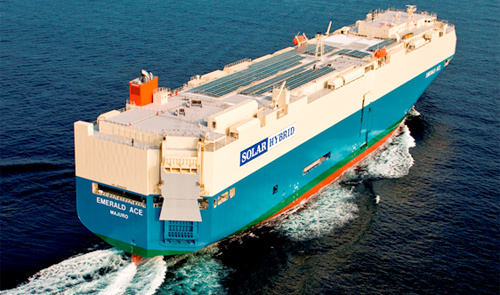 The Emerald Ace was built as world's first newly built hybrid car carrier, and is equipped with a hybrid electric power supply system that combines a 160kW solar generation system(*) - jointly developed by MHI, Energy Company of Panasonic Group (President: Masato Ito), and MOL - with lithium-ion batteries that can store some 2.2MWh of electricity. Conventional power generation systems use diesel-powered generators to supply onboard electricity while berthed. On the Emerald Ace, electricity is generated by the solar power generation system while the vessel is under way and stored in the lithium-ion batteries. The diesel-powered generator is completely shut down when the ship is in berth, and the batteries provide all the electricity it needs, resulting in zero emissions at the pier. The vessel's hybrid system represents a significant step forward in realizing ISHIN-I, the concept for the next-generation car carrier that MOL announced in September 2009. MOL continues to take a proactive stance in technological development with the aim of reducing the environmental burden of its vessels and operations. The words "Solar Hybrid" on the aft of the hull designate the ship as a hybrid that makes use of renewable energy. The development of the Emerald Ace was subsidized by the Ministry of Land, Infrastructure, Transport and Tourism as a project to help reduce CO2 emissions from ocean-going vessels, and received support from Nippon Kaiji Kyokai as a cooperative development project to reduce greenhouse gases produced by ocean shipping operations.